Thank you for visiting our page. We are very pleased that you are considering having a gospel choir to sing at your deceased/loved one funeral ceremony. We know that we will add something very special to make your ceremony memorable and comforting. Having the Gospel Touch Choir sing at your beloved funeral will certainly give the diseased a perfect send off. As gospel singers, we aim to help alleviate whatever burden associated with music during the funeral. To make the burial of your loved one a memorable one, it is advisable you that you hire a funeral gospel choir (Gospel Touch Choir). One of the benefits of going with GT gospel choir hire is that we put your request in mind while delivering the best. A standard booking at the ceremony would involve the choir of either four or six singers or more accompanied by a pianist performing up to five songs or more; for example: The first song whilst the casket is being carried into the church, the second after the welcome address, eulogy and prayers for the deceased, and one to two hymns, recessional hymn as the congregation leaves the church following the casket of the deceased. However, we are flexible to sing as many songs as possible during the ceremony. In addition, GT gospelChoir can also perform at the reception and grave side or just at the graveside if required. Bereavement and funerals can often be a distressing time. Our first duty is to offer professional and sympathetic songs conducted with dignity, care and compassion. Making choices of how to celebrating the life of loved ones can be a daunting task for mourning family members. Our professionally trained gospel singers and instrumentalist are great option. 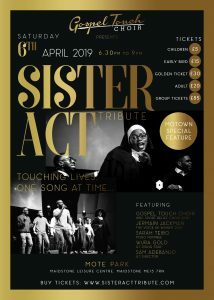 Gospel Touch Choir bring the comfort and solace of live music to any funeral service from sacred hymns at church services to rendition of chosen specific songs that have special meaning to your family. No doubt music speaks volumes about the personality of the deceased and serves as a comforting memory for guest and bereaved family members at the funeral service.